Devon believes he has finally found a place where he can be passionate about his work. 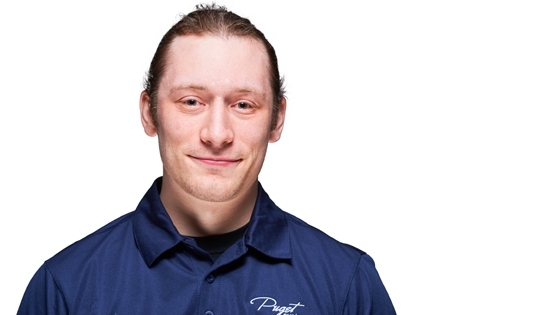 He enjoys the whole problem solving aspect of building computers, but says that the best part of working at Puget Systems has been the company environment and all the great people that keep our company moving forward. Devon has been passionate about electronics and computers ever since receiving his gameboy as a wee lad. However he became seriously into computers and hardware shortly after high school when building his first "real" computer in order to max out the FPS for every advantage. Devon's dream computer would have to be creating the ultimate RTX Atari 2600. A completely stealth Atari but with ray tracing and all kinds of power packed into it. Some games that Devon recommends include the fire emblem series, Fallout 3 and New Vegas, and is currently really enjoying Hollow Knight. Outside of Puget Devon likes to stay active when possible with week long backpacking trips every summer, and hiking with good company. However when not out in the wilderness he might be the biggest coach potato around, willing to become a vegetable and zone out on Netflix with a pound of candy.